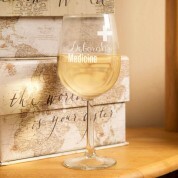 Enjoy a glass of wine after a long hard day...enjoy it even more by drinking out of your own personalised glass! The laser engraved design is personalised with their name, alongside the “medicine” text and classic medical cross above. 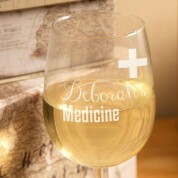 With this glass it's time to relax with a drink of wine in hand...just what the doctor ordered! It's a fun and quirky gift, especially for any doctors and nurses. 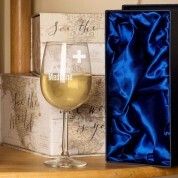 A great gift for their birthday, Christmas, or Mother's Day.